One of my favourite places in Australia’s high country is Long Plain in Kosciuszko National Park. 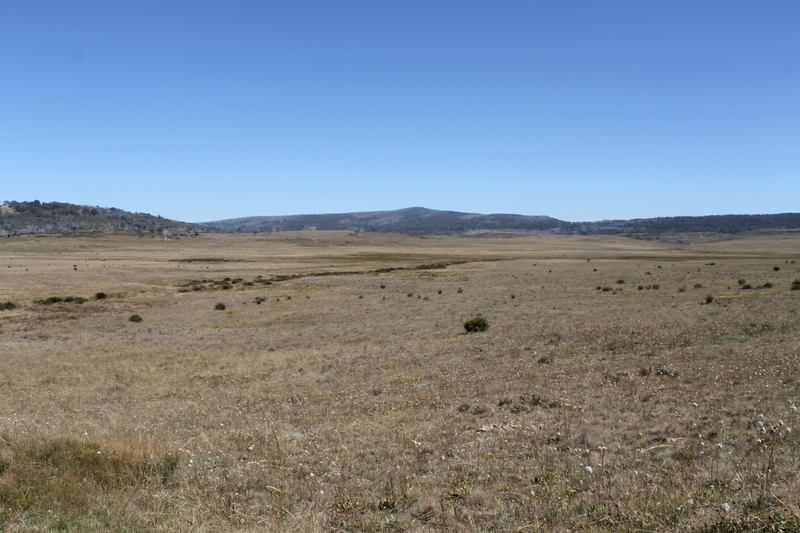 The subdued topography of this open grassy plain in Northern Kosciuszko presents a marked contrast to the 2000 metre whaleback mountains and alpine ridges of Southern Kosciuszko. 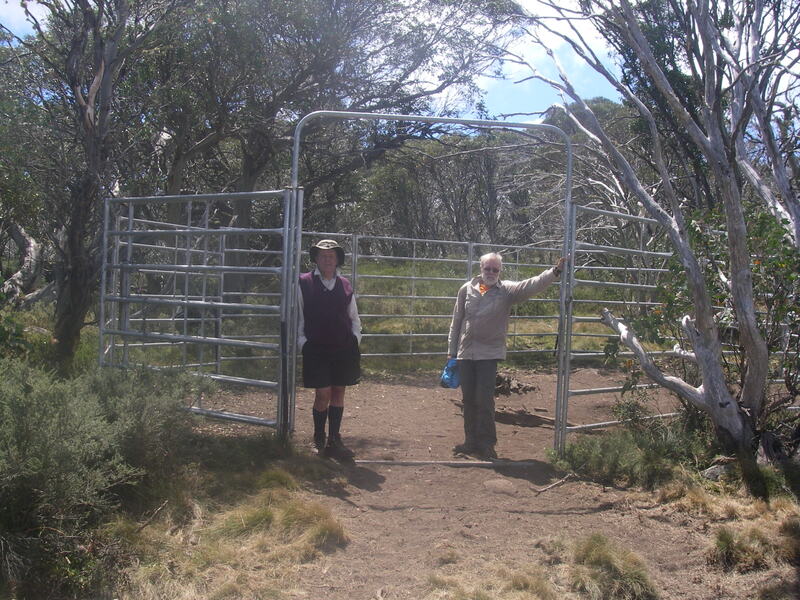 On a recent trip to Northern Kosciuszko we camped at the Long Plain Hut and also hiked in to Hainsworth Hut, an old grazing hut, via the Mosquito Creek Trail. Long Plain, in Kosciuszko NP, is one of the many high frost plains between the Brindabellas and Kiandra, all mostly above 1300 metres. These are called frost hollows or cold air drainage basins and are naturally occurring treeless plains formed when cold heavy air drains into depressions along the valleys of creeks and rivers. The pooling of frosty air suppresses the growth of tree seedlings and consequently the plains are bereft of trees, even the amazingly hardy snowgums. 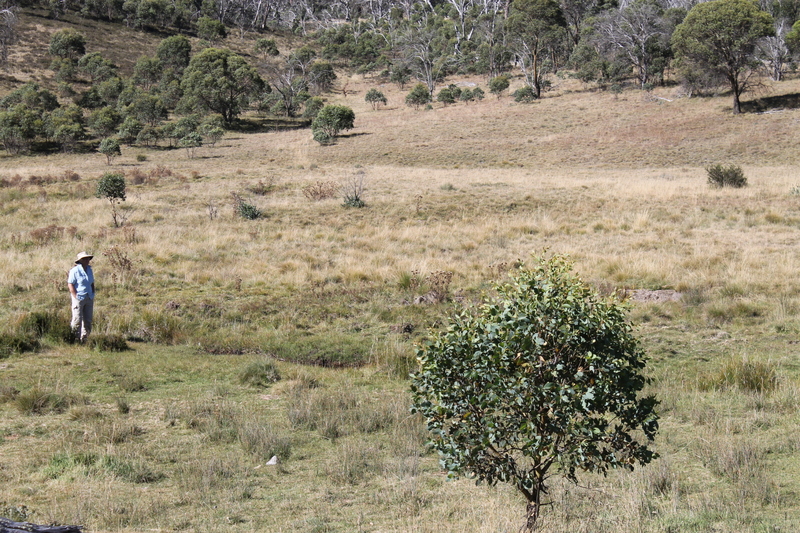 Instead, the snowgums and black sallees grow on the ridges above the valleys: thus an inverted treeline. Long Plain is, as its name implies, a long plain. 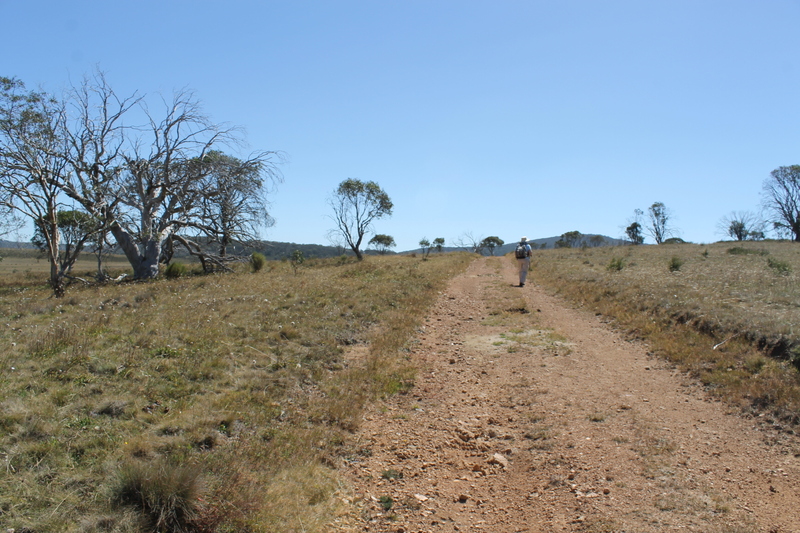 About 30 kilometres in length between Peppercorn Hill in the north and Bullocks Hill to the south, this is an immense open grassland drained by the upper reaches of the Murrumbidgee River or Murrumbeeja. 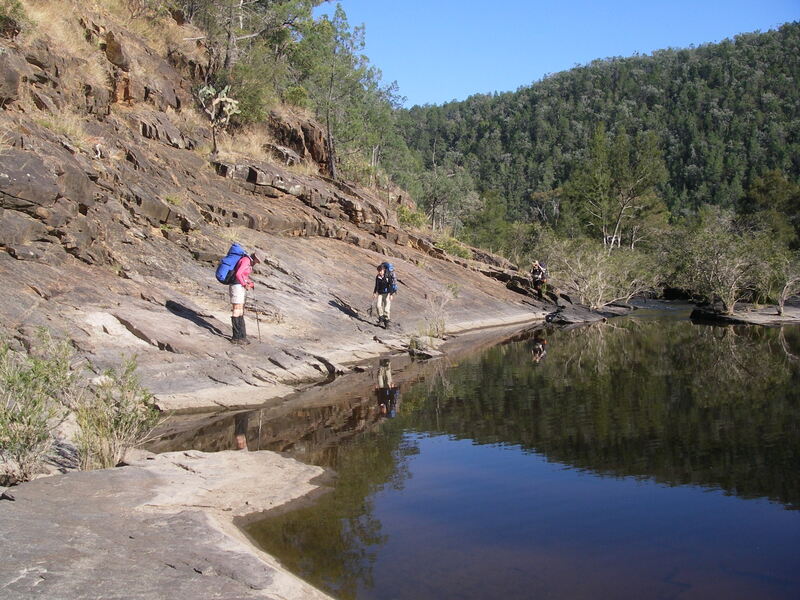 Its European discoverer was Charles Throsby Smith who, in March 1821, followed the Molonglo River to its junction with the Murrumbidgee, close to the present site of Canberra. Seventy kilometres south-west of Canberra, the Murrumbidgee rises on Long Plain in an amphitheatre formed by the apex of the Fiery Range and the Gurrangorambla Range, near Peppercorn Hill. 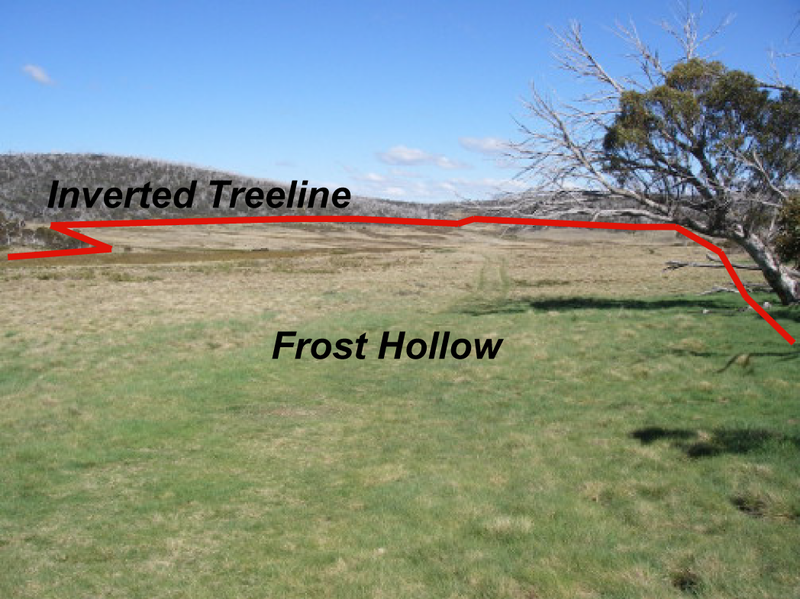 From here it initially flows south-south-west following the line of the Long Plain Fault, a major structural feature extending from about 25 kilometres north of Brindabella, through Kiandra to just west of Mt Kosciuszko. 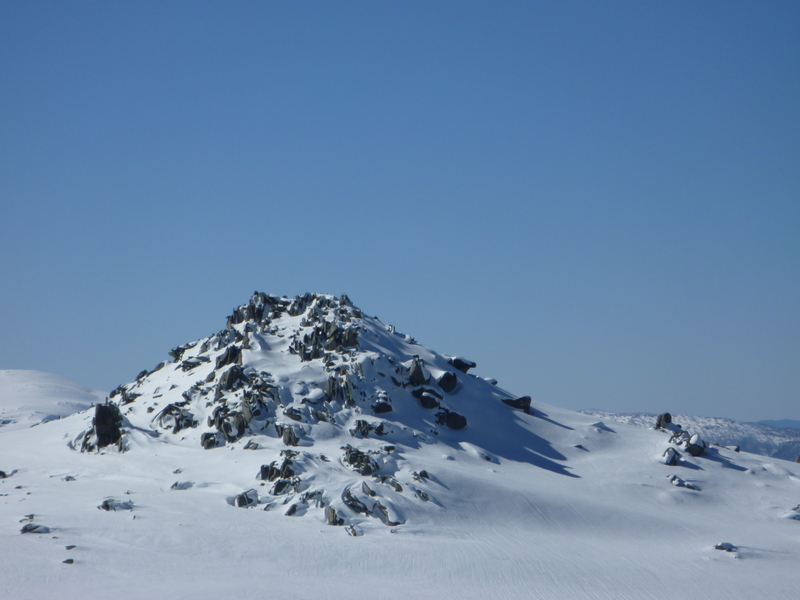 The plain is bounded by the Fiery Range to the west and, a few kilometres to the east, a line of 1600 metre peaks: Mt Nattung 1618m, Whites Hill 1597m, and Skaines Mountain 1601m. 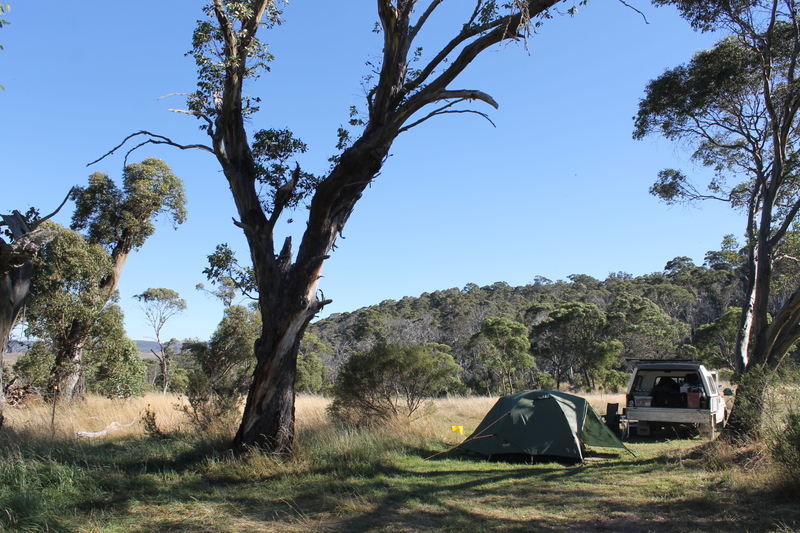 Long Plain’s open grassland vistas, a cultural heritage of grazing huts, interesting bird sightings and the possibility of spotting wombats, dingoes and brumbies make for a great walking and camping experience. Any time between October and May is a good time to visit but access gates are locked in winter as snowfalls blanket these high plains. Other northern frost plains worth investigating include Coolamon, Tantangara, Gooandra, Boggy, Dairymans and Currango. 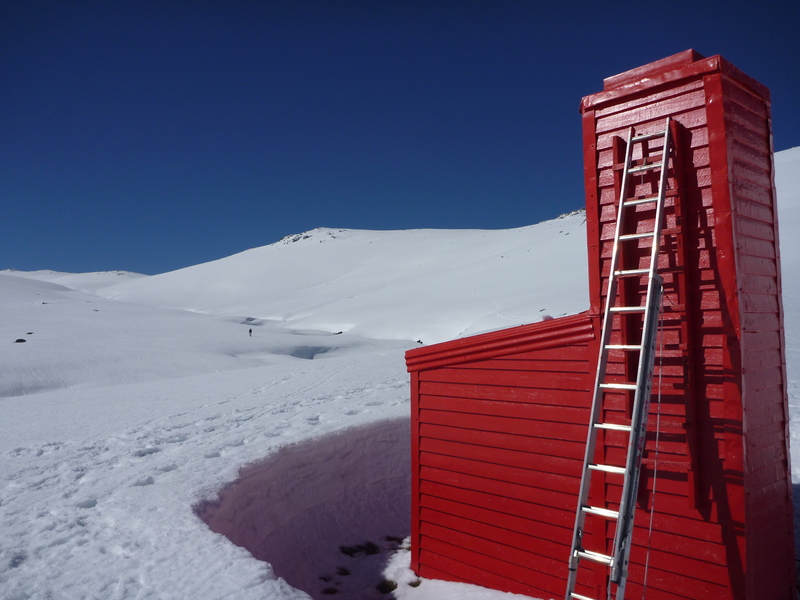 We had fine warm days and a coolish night for our March overnight trip into Hainsworth Hut. It is an easy walk following the Mosquito Creek Trail which obligingly contours along the lower edge of the sub-alpine woodland for most of the way. The woodland was typical snowgum-black sallee dominant with an understorey of shrubs and snowgrass. Conveniently placed logs provided opportunities to perch and spy on the local birds. The usual high country customers appeared in due course: Wedgetails, Red Wattlebirds, Crimson Rosellas, Ravens and Flame Robins among the more obvious. Although horse riding and mountain bike riding are permitted on the Mosquito Creek Trail we weren’t bothered by either. 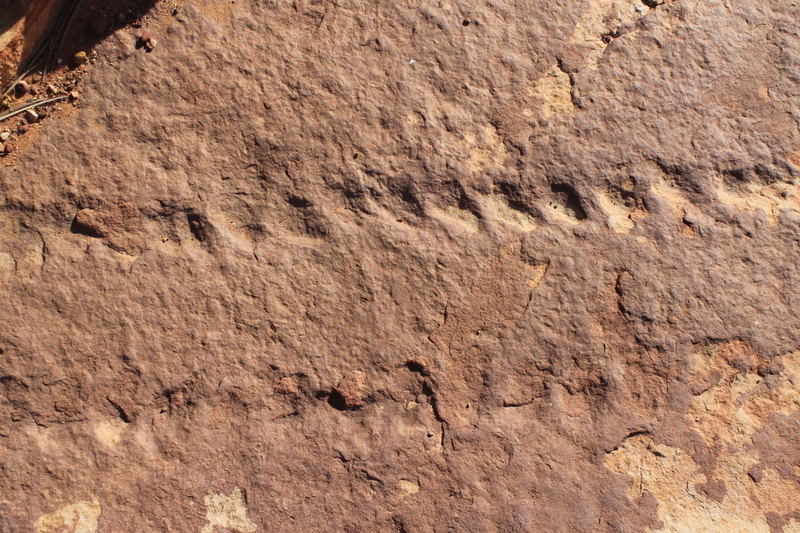 But the pyramids of horse poo, hoof marks and tributary brumby pads attested to the presence of horses, wild or otherwise. This was borne out in the number of entries in the hut log book mentioning brumby sightings and horse riders clip-clopping in from Ghost Gully or Cooinbil Hut. Australian Alps Walking Trail marker. Evening clouds over Long Plain. The vast majority of visitors come in summer. I found my old entry from a Kiandra to Canberra trip in May 2012: this was the onset of winter and virtually no-one came through after our party until five months later, the spring thaw in October. But our current trip was in early autumn and the weather was brilliantly fine but leavened with a sneaky alpine breeze. We pitched our two-man Salewa on the cropped grass and had a very comfortable night under canvas. 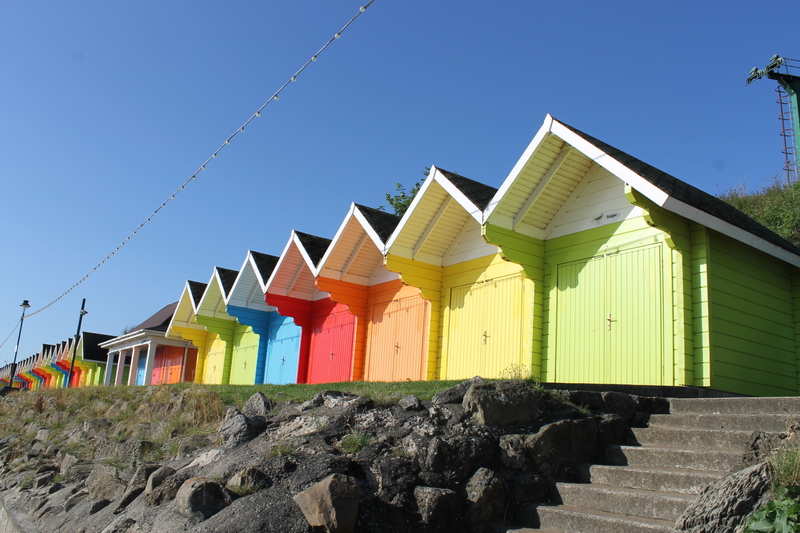 The general rule is that huts should only be used for emergencies in bad weather. Hainsworth was one of a string of grazing huts built along Long Plain. Others included Long Plain Hut, Millers Hut, Jannets(ruin), Cooinbil, Peppercorn (ruin), Little Peppercorn(ruin) and Pethers (ruin). Klaus Hueneke in his well researched and interesting reference book Huts of the High Country estimates that there could have been up to 20 huts across the plain at the peak of grazing. For the mountain hut afficionados among you I can recommend books or articles written by Klaus Hueneke and the Kosciuszko Huts Association website. Hainsworth or Landrover Hut is a simple two-roomer, a bedroom and a kitchen. It was built in about 1951 by Hainsworth and Corkhill as a summer grazing hut. It is clad in corrugated iron, has two doors and two hatch windows, an open fireplace and solid wooden floor. Like most of the high country huts it is well sited: sheltered from westerly winds, close to a supply of water and timber, with magnificent views over grassy flats and a morning sun aspect allowing the hut’s inhabitants to thaw out. 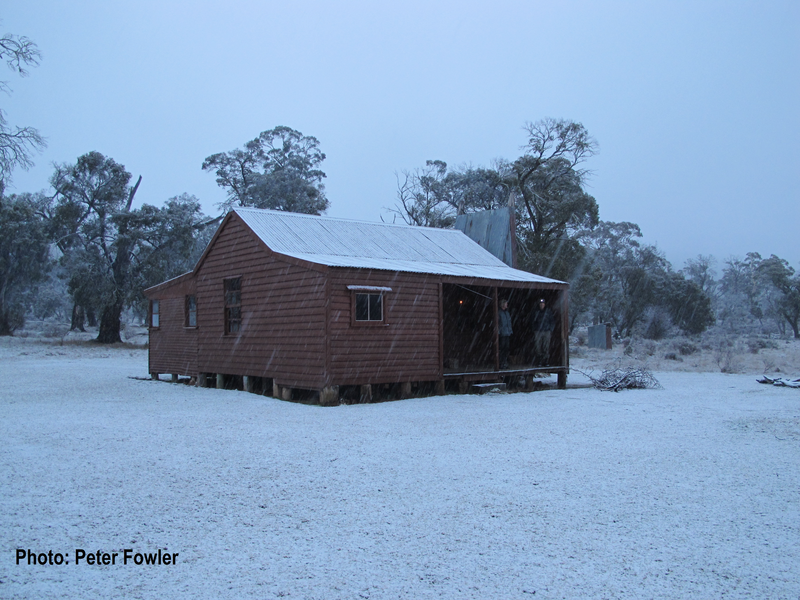 Hainsworth Hut has an excellent location overlooking the grassy flats of Dip Creek. Recently I read Miles Franklin’s Childhood at Brindabella which is recommended reading for all high country enthusiasts. 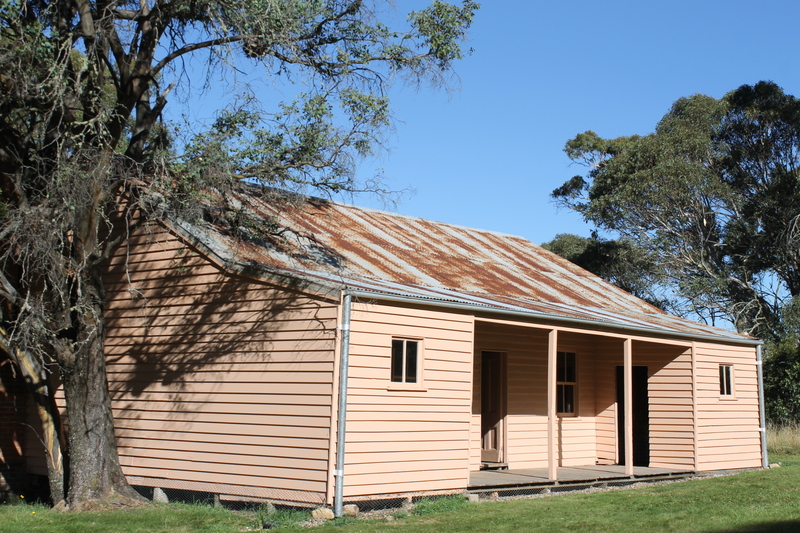 Stella (Miles) Franklin was born at Lampe Homestead, a grazing property at Talbingo near Tumut in 1897. She went on to write 21 Australian books. 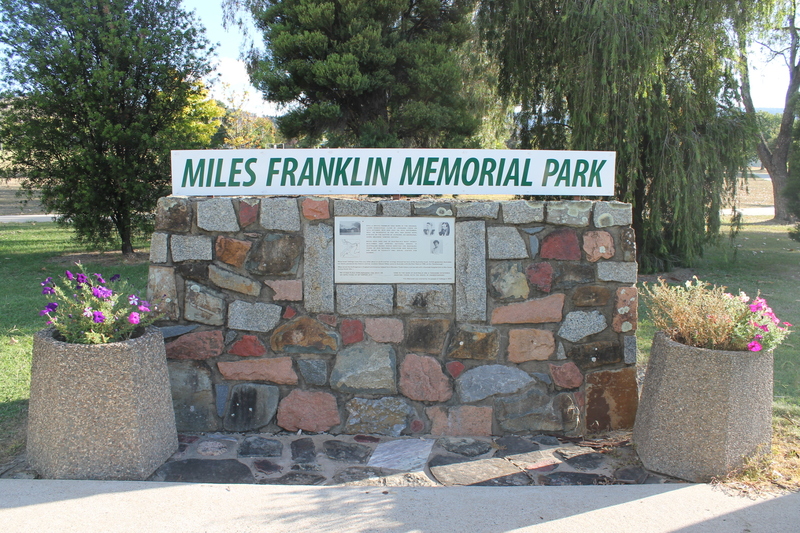 Miles Franklin spent the first ten years of her life at Brindabella only 50 kilometres to the north east from Hainsworth Hut. Childhood at Brindabella is an excellent snapshot of the life and the landscapes of Northern Kosciuszko and the nearby Brindabella Ranges at the turn of the 20th century. Sixty years ago the creek flats below us would have been alive with grazing sheep. A record in the log book by Bill Hainsworth’s daughter noted that up to 3000 sheep would graze around the hut and its environs. But we had to content ourselves with the lone fat and prosperous dingo that cruised along the treeline opposite our vantage point in the doorway of the hut. We watched for quite a while as it went about its doggy business scoping out various burrows and tunnels. Judging by the prevalence of rabbit burrows, our dingo would have no difficulty in getting a decent feed for tonight. In all my walks in the high country I have had only two previous encounters with this splendid apex predator, a subspecies of the grey wolf. 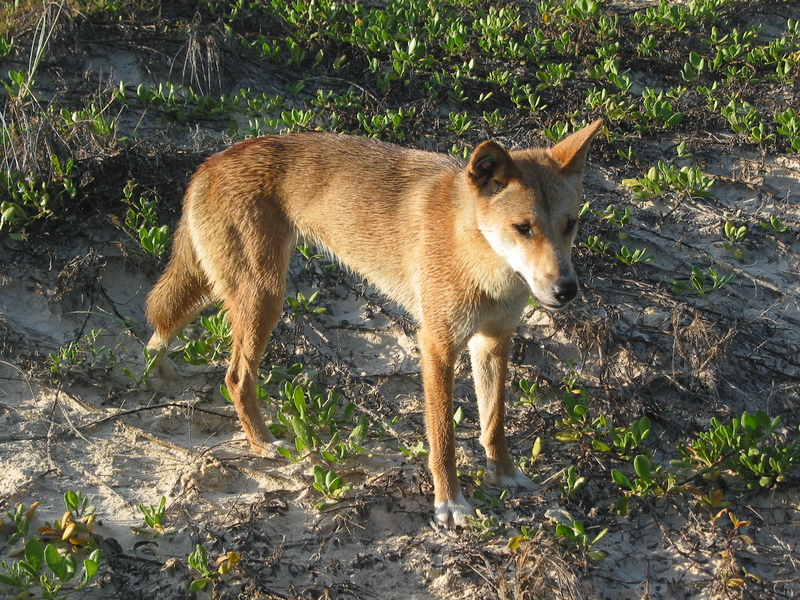 My dingo bible, Laurie Corbett’s The Dingo in Australia and Asia, says that the alpine dingoes are a distinct subspecies, one of three in Australia. They feast on rabbit, wallaby, wombat with the occasional brumby foal thrown in as a special treat. They are actually quite lazy hounds, rarely travelling more than two kilometres a day and their territories are small ellipsoids, with the long axis only twelve kilometres in length. On dusk just as we were drifting off to sleep I heard an ever so light drumming of hooves outside the tent. I peered out through the Salewa’s nifty little plastic window. Below, on the creek’s edge, a mere hundred metres away, a solitary brumby drank from Dip Creek. In Australia, non-domestic horses are generally known as either brumbies or wild horses or feral horses. The term brumby is attributed to James Brumby, who released his horses to run free on his land in NSW when he was transferred to Tasmania in the 1830’s. There is no doubt that horses have played an important part in Australia’s recent history as they have been involved in exploration, mining, racing, transportation, grazing and droving, and as part of the mounted police and Australian Light Horse Regiments. The recent approach adopted by the NSW Parks Service has been trapping the brumbies then removal from the park. Not all that effective as I have observed me from my extensive walks in Kosciuszko. 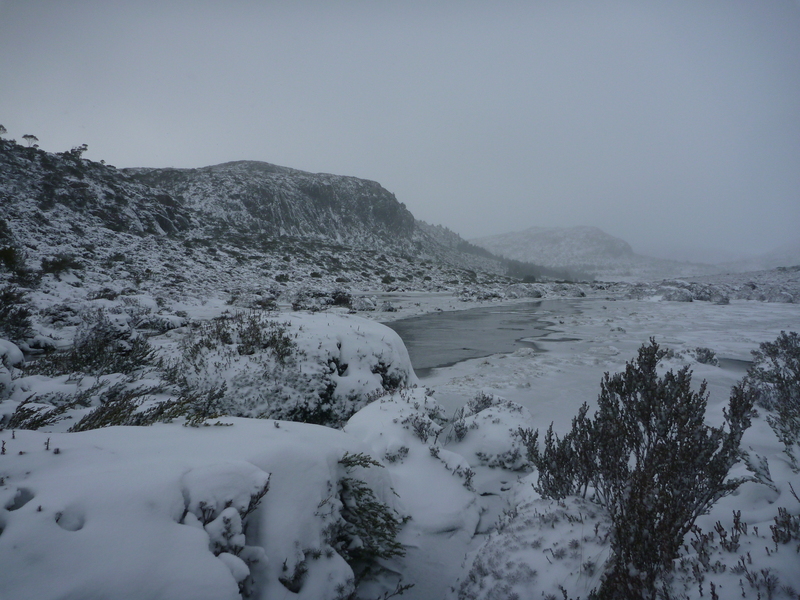 It seems to me that trapping is the only workable solution in that it balances conservation of alpine ecosystems and the desire on the part of horse lovers to maintain their high country grazing heritage. A great read about all these issues can be found in Australian Geographic Vol 130. Written by Amanda Burdon with photographs by Jason Edwards, it is the best summary that I have read thus far. Subscribers to Aust Geog can login to the site to read full article but Jason’s photos are available at the following link: Photo Gallery. Saturday dawned fine and cool. Ideal conditions to putter back along the Mosquito Creek Trail to our ute, still standing unmolested under a grove of shady snowgums at Ghost Gully. After a gourmet meal of crusty bread, cheese, cheesy Ched biscuits and lemon barley cordial we made tracks for the Long Plain Campground. 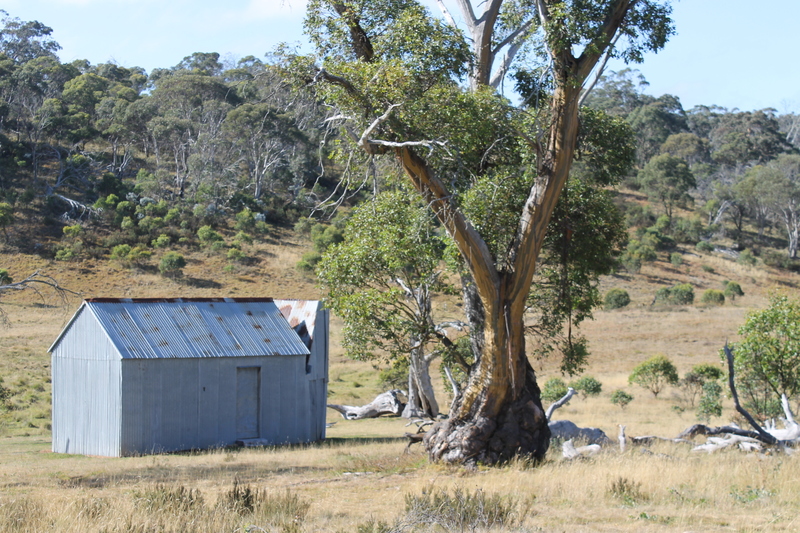 The hut occupies a beautiful spot in a stand of gnarled old snow gums and sallees, overlooking Long Plain. It is accessible by 2WDs and has a day use area and two very pleasant low key campgrounds; one for car camping and one for horse camping. 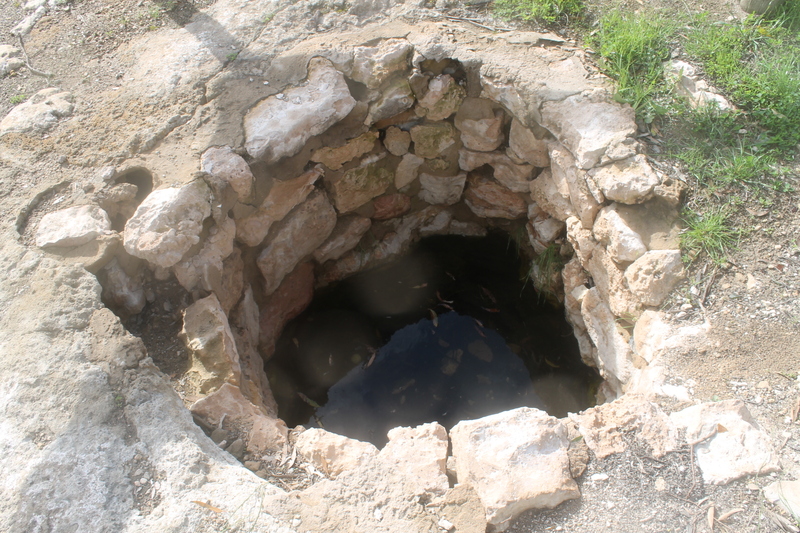 The spacious horse camp, on a small knoll, has its own set of horse yards with a stream nearby. This is where we camp. Unregulated grazing started on Long Plain as early as 1830 and by 1900 there were 22 large snow leases in the high country. In 1909 Arthur Triggs of Yass leased a big chunk of the plain, about 28,300 hectares. Later, when the lease was subdivided, a Dr Albert Campbell of Ellerslie Station, Adelong obtained several thousand hectares of the old Long Plain Lease. In 1916 he had this sturdy weatherboard grazing homestead built by Bobby Joyce. The timber was milled at Jack Dunn’s sawmill at nearby Cumberland Mountain and drayed to the site by Peter Quinn of Kiandra. Like nearby Coolamine Homestead, Pockets Hut and Old Currango it is a far more substantial structure than most of the pokey summer grazing huts. It is a massive 13 metre x 7 metre building consisting of a central hall, four large rooms clad with tongue and groove, four windows, a partly-enclosed back verandah and two fireplaces. During its first winter the shingles on the roof split and were eventually replaced by corrugated iron. It was variously known as Campbell’s, Dr Campbell’s, Oddy’s and Ibbotson’s, depending on who occupied the hut. The final occupants were Jessie and Fred Bridle, fencing workers who lived in the hut in the 1960’s. 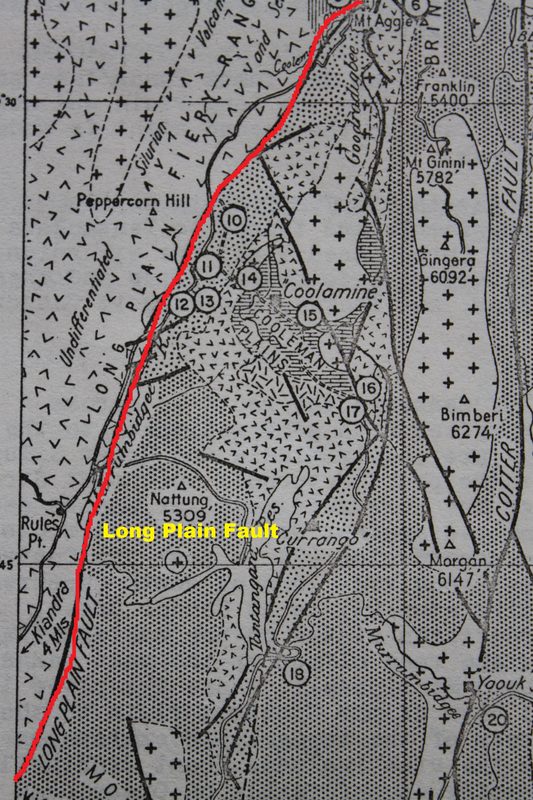 Long Plain was also the focus for rabbit trapping and shooting as well as gold mining. Rabbit trappers lived in the Long Plain hut during the depression years of the 1930s when rabbits had reached plague proportions across much of Australia. Rabbiting provided a source of income during the depression. Source: Phyllis Dowling Collection. Rabbit skins drying on verandah of Long Plain hut. Circa 1939. 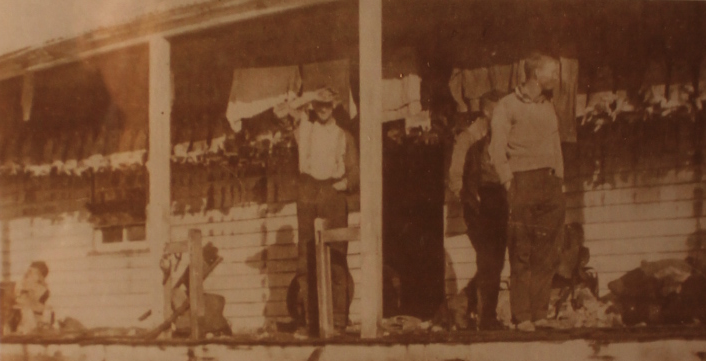 Another activity on Long Plain was gold mining. Joseph York worked a small mine just to the north of Long Plain hut until his death in 1898. Later operators of the mine were Tom Williams ( in the early 1900s), Tom Taylor and Bill Harris in the 1930s. These pioneers are remembered in the naming if two creeks just north of the hut: Yorkies Creek and Taylors Creek. 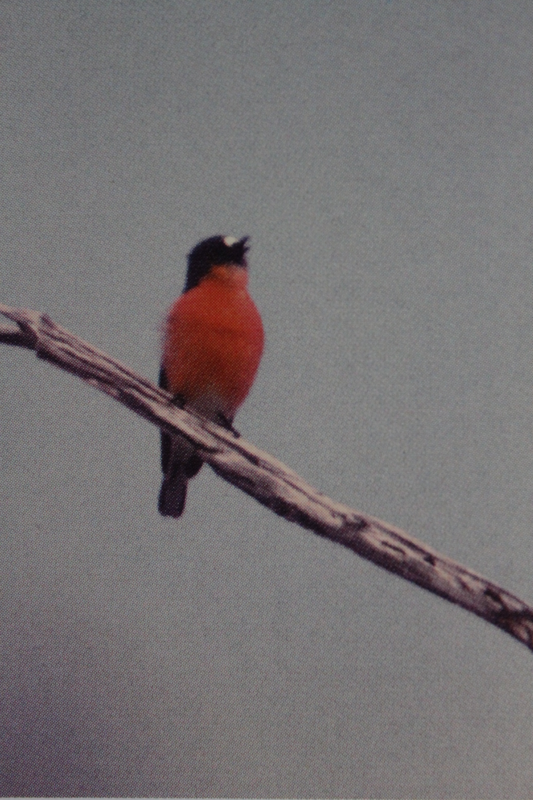 Green, K and Osborne, W: Field Guide to Wildlife of Australia’s snow-country. Hueneke, Klaus: Closer to Heaven: Aust. Geog.93. Smith, B: Dingo relationships: Wildlife in Australia.Spring 2009. Dept. Nat. Dev. 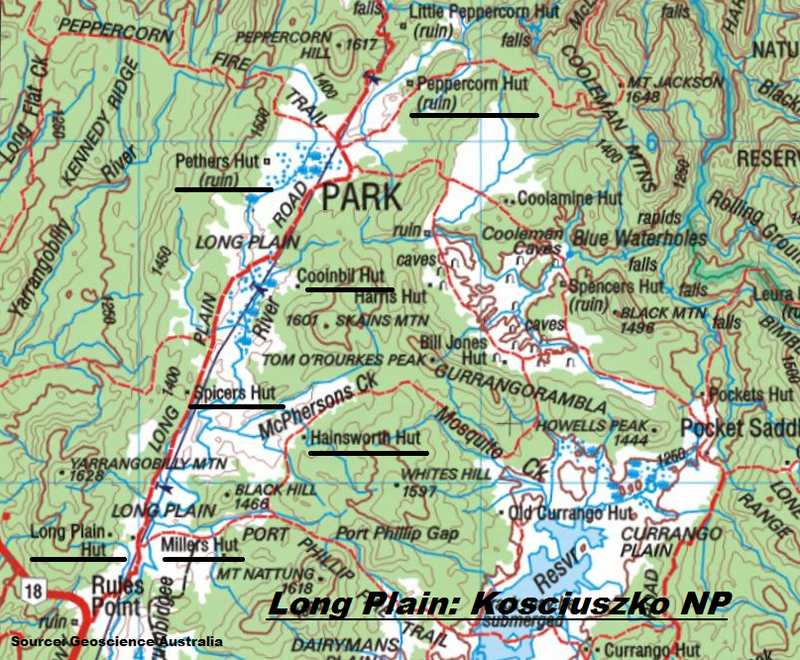 Geological Excursions: Canberra District. 1964.